Session fees are all-inclusive (with the exception of Texas state sales tax of 8.25%) meaning you won't be blindsided by additional, outrageous print prices and confusing packages. Session fees cover any pre-session consultations, time and talent, travel costs, use of props and backgrounds, professional editing and retouching, an online viewing gallery and a limited number of high resolution jpeg digital files with printing rights. Discounted professional products and archival-quality prints are available separately. A non-refundable 50% initial payment and signed portrait agreement are due at the time of booking. The remainder is due on the day of the photoshoot. OMG, you just made a human! Let me capture the AWE-someness of your new little one's existence. The best timing is within the first 14 days, when your baby is super sleepy and bendy. They will only be this tiny for a very short period of time and you don't want to forget it! I will come to your home and bring everything needed or, for even more prop options, you can come to my new studio in West Lake Hills. 2-4 hour styled and/or lifestyle portrait session in the comfort of your own home. Shareable online viewing gallery with 30+ images. Entire gallery of high resolution digital files with printing rights, delivered via digital download. 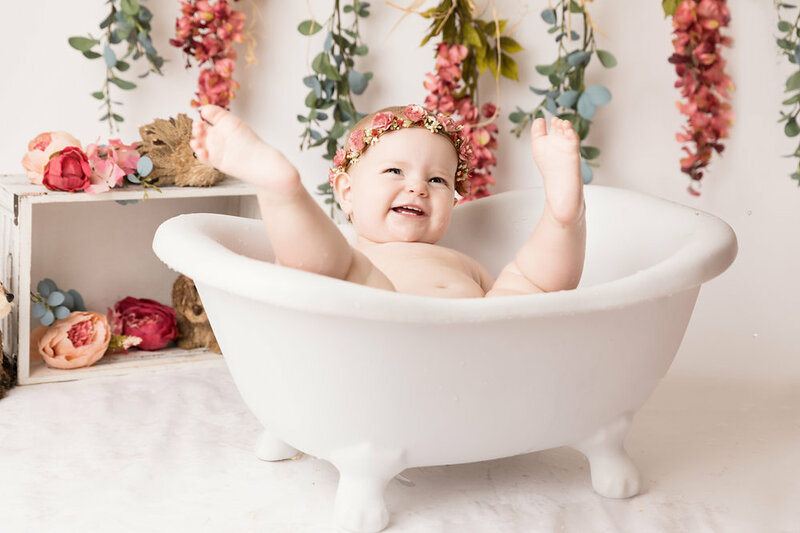 Session workflow includes family and sibling poses (if desired), wrapped poses, beanbag poses (clothed and/or naked), macro (close-up) images of baby’s features, and one prop set-up. 2-4 hour styled portrait session, including parents and siblings (if desired), in my new studio in West Lake Hills, TX (which means access to all of my props!). 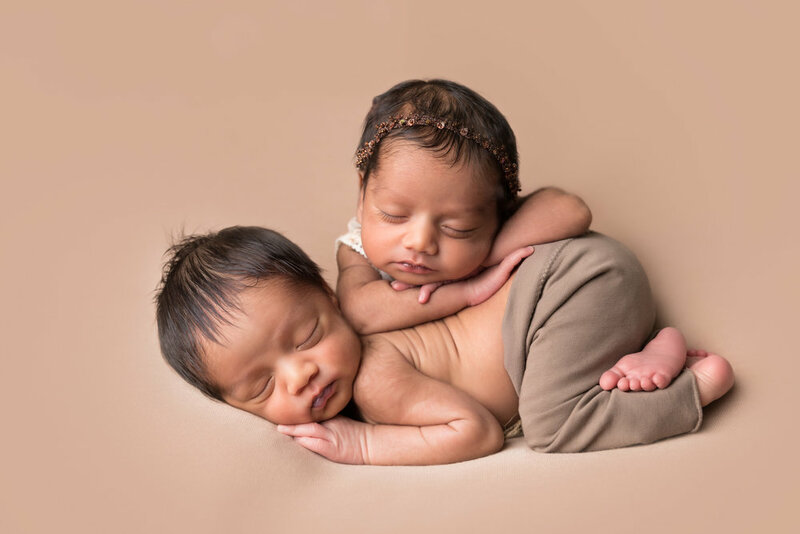 Session workflow includes family and sibling poses (if desired), wrapped poses, beanbag poses (clothed and/or naked), macro (close-up) images of baby’s features, and 2 or more prop set-ups. 2 hour styled portrait session, newborn only, in my new studio in West Lake Hills, TX (which means access to all of my props!). Shareable online viewing gallery with 15+ images. Session workflow includes wrapped poses, beanbag poses (clothed or naked), and 1 prop set-up. 3 milestone sessions - a 3/4 month ‘tummy time’ session, a 6/9 month ‘sitter’ session, and a 1 year old cake smash session ($300 discount!). Each session includes a shareable online viewing gallery with 30+ images. Each session includes the entire gallery of high resolution digital files with printing rights, delivered via digital download. Cake smash session includes custom-designed set, cake or food product, and use of child’s outfit. You just had a baby and these first hours are so precious and fleeting. Let me document all of the brand new-ness like the wrinkly feet, the tiny fingers, hospital details, etc. Put the cellphones and tablets away for a bit and let me capture all of the sweet family interactions with the new baby. These sessions are short and sweet and totally stress free. There's no posing, no props, and no pressure but the images are priceless...they are just so "real". Approximately 30 minutes of shooting time. Usually held in the hospital within the first 48 hours. Entire gallery (45+) of web-sized jpeg digital files in color and black & white. Prints and high resolution digital files sold separately. $400 or $200 (50% off) if you also book a newborn session. Family sessions may include as many family members as you would like and are held at the location of your choice. Baby milestone sessions are held in my studio or a location of your choice. I do a 3-4 month session for 'Tummy Time' when the baby can hold his/her head up well and usually starts smiling for us pretty regularly. A 6-9 month 'Sitter' session when s/he can sit up unassisted. And a one year birthday session if you aren't into doing a cake smash session. Of course we can do a child session at any age, but those are just the standard milestones. Maternity sessions can also be held in my studio or a location of your choice and are half off when you book a newborn session! Approximately 1 hour of shooting time. Entire gallery (30+) of high resolution digital files with printing rights delivered via digital download. These are so much fun! 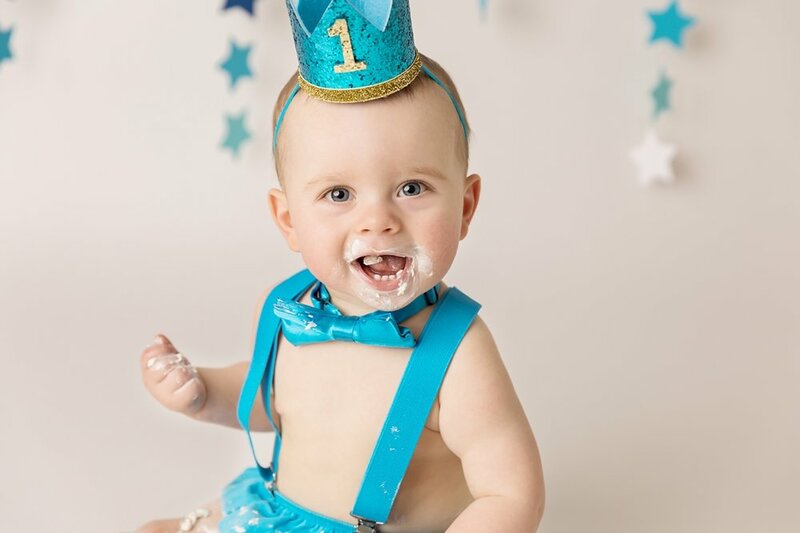 To celebrate this major milestone we let your little one have at it and smash the heck out of his first birthday cake. We can also do an alternative smash session using other messy foods (spaghetti, tacos, donuts, you name it). I will custom design a set according to a theme or color scheme of your choice. We will take a few portraits at the beginning of the session, then photograph the smashing (be aware some babies love it, some babies hate it, and some are somewhere in between...we never know what's going to happen!). Then we do a fun 'splash' session at the end to get the baby all cleaned up. Held at my studio or a location of your choice. Entire gallery (45+) of high resolution digital files with printing rights, delivered via digital download. Shareable online viewing gallery available for 60 days. $475 (you supply the cake and child's outfit) or $525 (I supply everything except the cute baby).